Why was this neatly turned-out man waiting outside Paul's Daughter with a padlocked briefcase? The pace of change along Fifth between 9th and 12th is swift. In all my time here, Sun Bo Bo (between 10th and 11th) has been a quiet & reassuring presence. Along with Garry jewelers (closed but at least still there with its glorious sign) and the late Timboo's, it's been a marker of another kind of avenue. It always gave my walk back home from the train a sweet note of pleasure. Back in March, I noted that Sun Bo Bo, at least for the foreseeable future, was closed - a consequence of family illness. Since then it's sometimes been shuttered, and sometimes had its doors wide open. Last week it was not open to the general public, but a group of favored postal workers were sitting by the window tucking into some food. Today it was open again but the cooking going on was for private consumption. The doors were open because it was so hot in there, what with the cooking and the humid weather. Its future is still clouded, a young man told me, as he tended to a cooking pot, and bills have mounted up. There are still serious medical issues. He talked about how hard it is to make a living here in the city, or the country as a whole, and about the different feel of the neighborhood. He talked rapidly, and looked exhausted. He didn't hold out much hope for the future. I doubt there'll be much fuss if, as expected, Sun Bo Bo closes down. Making no impact beyond its small few-blocks world, a modest Chinese restaurant will vanish softly & without recognition. But places like Sun Bo Bo do matter - a family run business, and part of a retail mix that serves all incomes. I'll be sorry when it's gone. Goggla took a trip to Coney Island earlier this week, and has the usual beautiful photographs to show for it. Check out The Gog Log to see them. I was there this afternoon, and the place was PACKED. Though I usually like things a bit quieter there ( a weekday afternoon is fine), it was fun to start off the summer this way. The lines for food and beer were long, & Ruby's was jammed. We had beers and hot dogs at Paul's Daughter instead, and even got a table. Just sit, and the city parades right past just for you. I looked around a bit on Surf, and strolled the boardwalk a short distance, but mostly stayed by Paul's. How free it felt to be there. I came home tired and thirsty, with the faint start of a suntan. Here are a couple of pictures. More later. Well, despite threats of closure, Hank's Saloon, on Atlantic & Third, is still hanging in there. Thank goodness for small victories. I've no idea what its long-term future is, though. I've been spending a lot of time looking at the Municipal Archives recently, and searching through the 80s tax photos, I found this one of 46 3rd. Avenue. 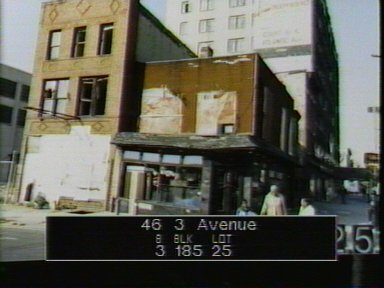 I think the building was still the Doray Tavern then. Marginally less decrepit, perhaps, but essentially the same. I'll have to go back soon. For earlier posts about the place, read here and here, & follow a link to a 1978 Doray scene. A fine sign on Queens Boulevard, in Sunnyside. Right next to the funeral home is Foxy's. The guy running the show when I was there had a miltary bearing, and worked with brisk and courteous efficiency. There's a choice of tea - Lipton's or Irish - & hurrah! the Irish tea comes in a pot. This made me happy and a little homesick. Further down Queens Boulevard, a nice view from the station & the perfect economy of Coffee, Beer, Sandwiches. Click on these for a better look. Did you think it was in the white or gray stone? or the lines of the arches and cornices?" Tucked away on Ryerson, between Myrtle & the BQE. The tallest house in the picture above is number 99. In 1855, Walt Whitman lived here, at the time when the first edition of Leaves of Grass was published. He was only here for a few months, living with his mother & other family members. His father died here. Walt had a room on the second floor, at the back. The top floor is an add-on, not there in Walt's day. Number 99 is the only remaining Brooklyn house that Whitman lived in. It has no commemorative plaque. This area of Brooklyn has the largest collection of pre-Civil War frame houses in the city. the Walt Whitman Project , which offers informative & entertaining free tours of Whitman's Fort Greene, led by Greg Trupiano. Thanks especially for the information about 99 Ryerson. Today's Times has an article on the final days of the New Barber Shop on Ninth Avenue in Chelsea. The small stores on this strip, between 17th & 18th Streets, will soon be replaced by a bigger business. Attractions like the Chelsea Market and the High Line have helped make the neighborhood more upscale, Mr. Castillo said. “I can live without work, but I’m sorry for my customers,” Mr. Castillo said on Tuesday as he shouted, “Arriba” to the next customer and motioned for him to sit in his barber chair. I was right on that block just a couple of weeks ago, coming back from the I Remember Joe Brainard documentary screening at the Kitchen. The poet Ron Padgett, a long-time friend of the late Brainard, & the film's narrator, was right across the aisle from me, and I was pretty excited to see him & (apologies) eavesdrop a little. 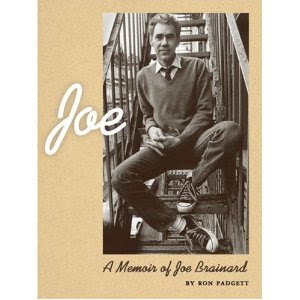 I walked into the city night in a buzz of Remembering , thinking about the poem, the film, the collected works of Brainard I'd just read, how nice a guy Padgett seemed, and the schoolkids around the city I'd done I Remember writing sessions with. Did I still have their memory poems somewhere? This is the next book on my reading list. It came out in 2004, and is published by Coffee House Press. Update: Right after I put this up, I realised that the fate of the block (and particularly, the New Barber Shop),was the the subject of extensive & beautifully written coverage by Jeremiah Moss at Jeremiah's Vanishing New York. You can read about it here, and follow the links to earlier posts. On a perfect spring day, it was time for a trip to a Queens institution: The Lemon Ice King of Corona. Benfaramo's has been in business since 1944, and is open throughout the year. As a first-time traveller to the court of the Ice King, the choice wasn't too hard. It had to be lemon. And it was good. This kind of place, and the ice vendors you still find on the city's street corners, serve up the real people's pops. The nearest subway is the 111th St stop on the 7 train. I've been a bit despondent when it comes to the backyard. There were no nearby decks when I first moved in, so when you were out there, your yard was your own little world. 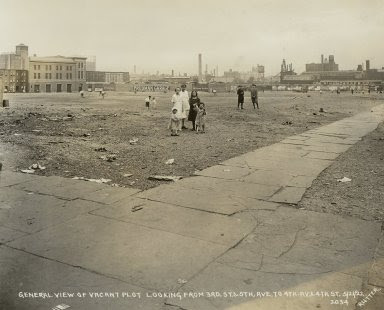 Sure there were buildings that overlooked it (and a naked tenant who liked to preen by a bathroom window), and outdoor parties in other people's places, but they didn't intrude. Now there are decks two doors down on either side, so there's plenty of loud, self-satisfied laughter to be heard, and conspicuous displays of professional leisure. It brings out my grumbling inner serf. If I head outside, two pit-bulls - bored, urban-chic mascots of their owners - glare down at me from above, and growl softly. Behind me, one lot over, looms a balconied condo building with walls of glass. The house next to it, directly behind our yard, was a mirror image of ours, but rotted away year by year as its elderly owner grew sick and died. It's been getting a pop-up rehab for the last two years, but work has proceeded at at a snail's pace, and now it sits unfinished, open to the elements. Still, I should enjoy the yard while I can. By summer's end there'll doubtless be a construction site next door. Right now, I still like to sit out there with a drink at the end of the day, with the cardinal singing blissed-out notes of pure joy from somewhere up high, and every so often, if I'm lucky, a flock of quarrrelsome parrots flying through. I can ignore looking up at the decks, and do my best to tune out the braying chatter. The pit-bulls generally make peace after a few minutes of suspicion, and flop back down into drowsy indolence. They're not bad guys. The yard is a bit scrappy looking, but it's full of green life. The lilac bush has grown enormous, and the honeysuckle is spreading along the fence. There are raspberries, rhubarb and herbs, and tomatoes self-seed every year. I'm a bad but optimistic gardener, and try to grow all sorts of other things unsuited for the heavy, glass-ridden dirt. Some of them make it. For the last few years there've been praying mantises out back, and mantis egg cases have become a more and more common sight. This spring I saw five. I wasn't expecting the mantises to hatch out yet, but I guess the warm weather hurried them along. On Monday, one of the cases bore tell-tale signs that its boarders had broken out. I searched for a while, but couldn't see any of them on the nearby leaves.. Today I had another look though, and there were a couple of tiny mantises exploring the hydrangea. I don't have a zoom lens, so this is the best shot I could manage. Stick around, little monster friend. Stick around. The Kentile sign has been appropriated so often on t-shirts & borough-boostering merchandise you wish they'd just let it alone for a bit. It's still a beauty though. Bruno Truck Sales has appeared less often on products than Kentile, maybe because it's not so close to the Culver Viaduct, and maybe because it was still an active business until two or three years ago. Like Kentile, it gets photographed a lot, but that's no reason for me not to do the same. It's a short walk away, and I like to come down and admire that looping script up close. The last week or so has been extremely busy. As a result, I feel I've barely had time to walk and think freely. In addition, the threat of next-door demolition (you could just try denial & pretend you'd dreamed it) is now exchanged for reality. It will be. When your house is attached to a demolition site, it's not a pretty state of affairs & "home" is an awfully fragile concept. A perfectly good hundred and forty one year-old frame house, designed as part of an attached row, is not valuable enough for today's market. In that other part of the Slope, there'll be an Open House tour next weekend, where visitors in special slippers will gaze at landmarked brownstone splendours, with chandeliered parlor floors, professionally landscaped gardens and high-end kitchens. You won't catch me there. Along with thousands of other New Yorkers, I've just started looking in the newly released Municipal Building photo archives. 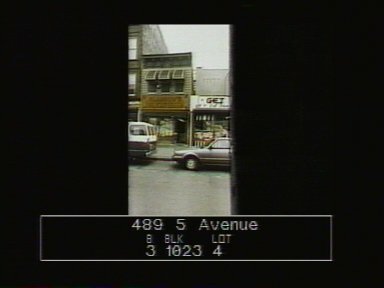 I began with the city-wide tax photos taken between 1983 and 1988. 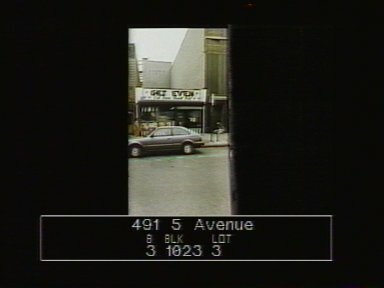 The images online are low-resolution, which makes for some very fuzzy views of an 80s city. Straining to look at them and read the names of stores is almost like trying to summon my own blurry memories of what went where in the streets around my home a quarter of a century ago. It was good to finally see a photograph of Glasgow's deli, two up from the OTB. I was starting to think I'd been making this place up. Suddenly there I am, back in shuffling line for milk or a paper, with down-on-their luck punters, and corner dealers. A darker, sourer, more cheerless deli you might never see. I don't remember Get Even though, and I think it must have closed before I moved around here. Sounds like a good name for a barbershop, maybe, but I believe it was some kind of candy store/video arcade. Glasgow's is now Tacos Nuevo Mexico, and Get Even (which was the first location for TNM) is currently a building site. The OTB, next to Get Even, is almost Jo, Brian & Joseph's Key Foods supermarket, and will open later this week if all goes as planned. I'll be dipping into the archives regularly.